My hair's been through a lot over the last couple of years. Due to my (ongoing..) dealings with Telogen Effluvium, I had around 18 months of 'heat free', and shunned the use of just about every hair product in my bathroom cabinet, in the hope that my hair would become more stable. Now, I'm introducing the occasional hair tool, and I cherry pick the products in my routine. 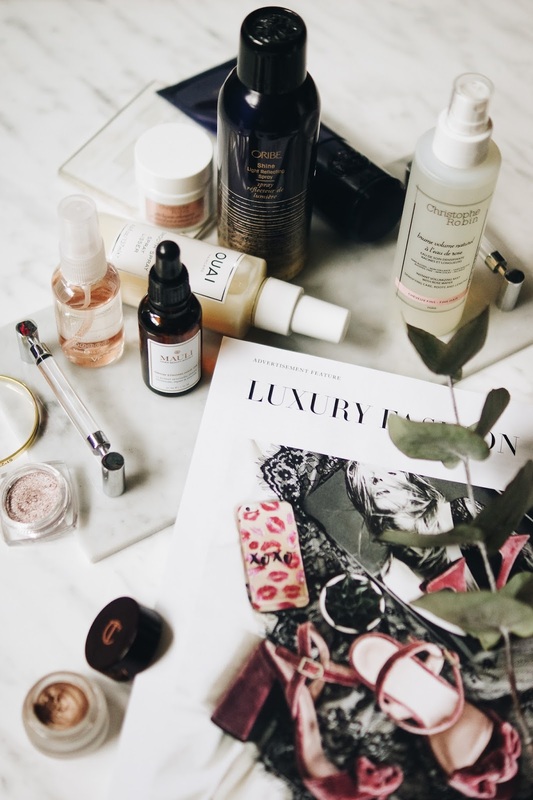 I've been enjoying trying more luxury haircare to give me the three cornerstones of all of my hair wishes; condition, volume and shine, so let me share some of my current favourites with you! 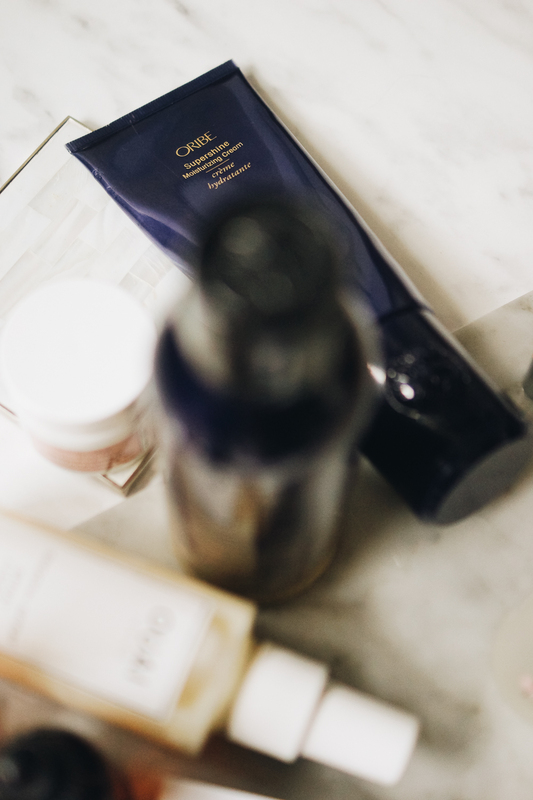 I love the Oribe Supershine cream (UK | US). It's slippery texture and pearlescent finish smooths down my hair, whilst adding a subtle sheen and utterly gorgeous scent. Whether or not your hair is coarse and thick, or fine and delicate, I think we can all do with a little drop of a good hair oil. 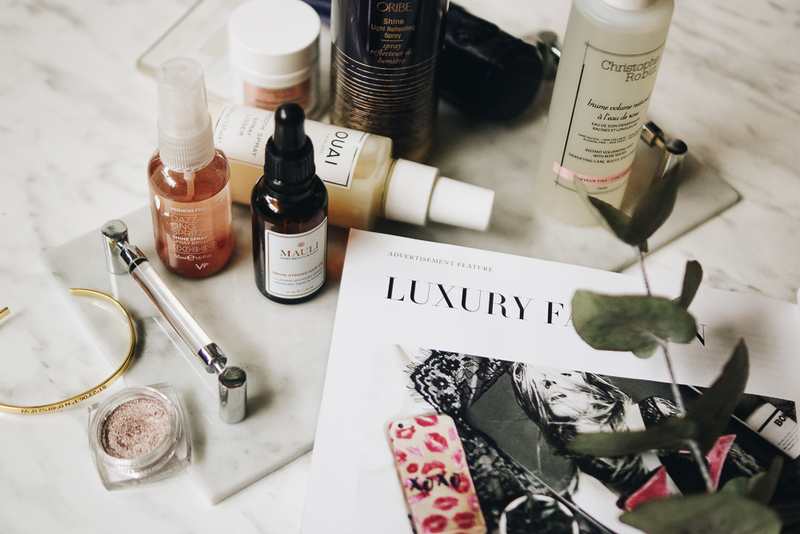 The Mauli Hair Oil (UK | US) contains 15 ayurvedic ingredients to help soothe stressed and damaged hair - I love applying just a few drops straight from the shower to soften up my ends. 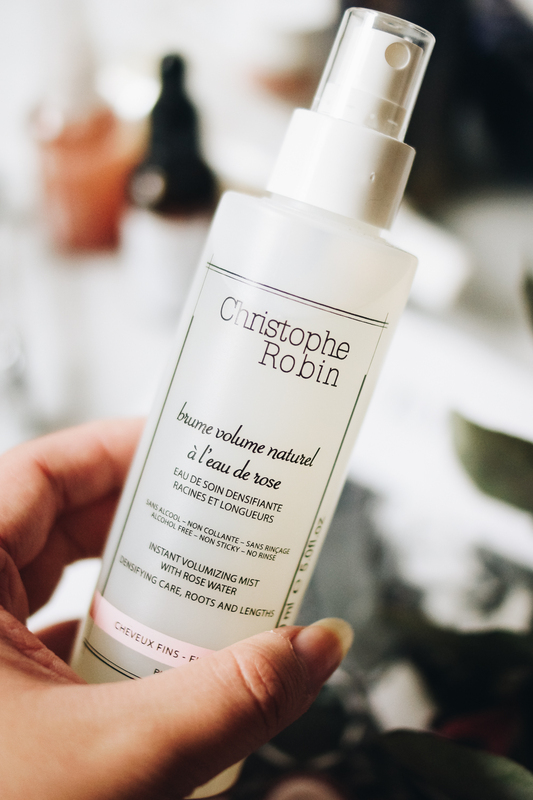 I'm thoroughly enjoying Christophe Robin's deliciously rose-scented, volumising range. A little spritz of the Volumizing Spray (UK | US) into either blow dried or naturally dried hair gives body and bounce to the roots. The Volumizing Paste (UK | US), a granular, clay-like substance, is a wonderful product to deep clean your scalp in the shower, and really helps those roots feel cleansed and lifted - I love taking the mini with me on-the-go. I'm so very fussy with shine sprays. The products I've tried in the past have all sadly given one of two outcomes; either they leave my hair feeling crisp, crunchy and lacquered, or they do nothing. But I've finally stumbled across two products that break that mould. The Oribe Shine Spray (UK | US) is so deliciously light and airy, it gives shine, with swish and movement. 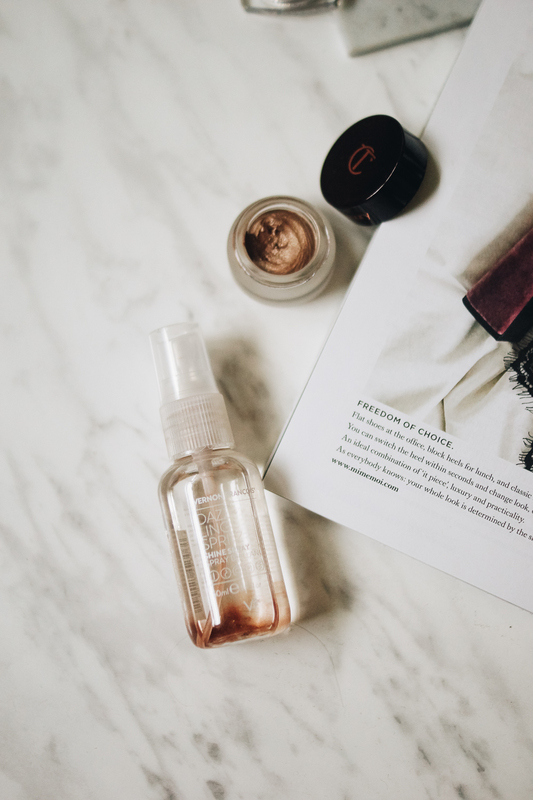 A new find is Vernon Francois' Dazzling Spritz Shine Spray (UK | US), an unassuming bottle of seemingly clear liquid that transforms into a magical, glittered, rose-gold snowglobe upon shaking. The little particles of mica really bring out the tonality of brunette hair. Another product worth a mention is Kiehls' Magic Elixir, but I think it's a pretty easy formula to replicate at home, and I'm currently trying my own DIY version which costs a fraction of the price. I'll keep you updated with how that goes (I'm loving it so far!) 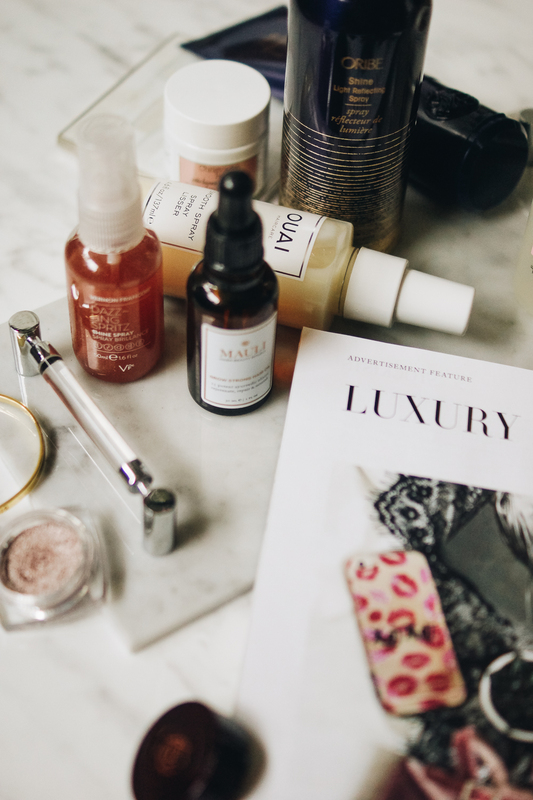 but in the meantime, I'd love to hear your favourite luxury haircare favourites! Ouai is always in my timeline and I totally want to try it, sounds like a must-have! All these hair products look amazing. I've really been getting into Oribe, I love their texturizing spray and I want to give their hair mask a try. I really want to try some Christopher Robin products this volume spray sounds just want I need. After cutting my hair from long to short I’ve really noticed how dry and coarse it is the ouai conditioner sounds like a good one to try. As for shine sprays my all time fav is the bed head headrush spray. An oldie but a goodie!! I really want to try out some Oribe and Ouai hair products, I have heard so many good things about them! I only recently discovered Ouai but I've been impressed so far :) the VF shine spray sounds amazing too! Did your telogen effluvium resolve itself? I have been battling TE since July. Went to dermatologist and had scalp biopsy, which revealed TE. Shedding may have slowed down but still happening. So frustrating.